PLEASE READ THE TERMS OF THE AGREEMENT CAREFULLY. ACCESSING AND USING OUR SITE YOU AGREE TO BE BOUND TO THE TERMS OF THIS AGREEMENT. 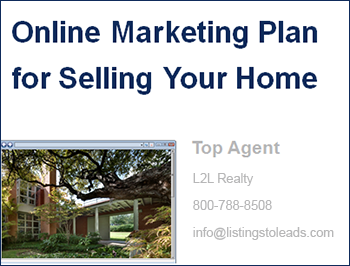 You can market listings, generate leads, sign up for our newsletter and/or communicate with us through the Site. Certain features of the Site require you to create an account. To use the Site you must create a user account by providing a valid email address, creating a unique password and valid credit card (“Account”). You are solely responsible for: (i) maintaining the confidentiality of your Account user name and password; (ii) ensuring all information used in connection with the Site is accurate and current; and (iii) any activity you conduct through your Account, whether by you or someone else. You must immediately notify us of any unauthorized use of your Account. We reserve the right, in our sole discretion, to terminate or suspend your Account. Site. We hereby grant you a limited, non-exclusive, non-transferable, non-sublicensable, revocable, license to access and use our Site as expressly permitted herein. Except for this limited license we do not grant you any other rights or license. We reserve all rights not expressly granted herein. Your Content. You hereby grant to us and our owners, affiliates, representatives, licensees, licensors and assigns a non-exclusive, fully-paid, royalty-free, world-wide, universal, transferable license to use, distribute, store, transmit reproduce any information you submit in connection with the use of our Site (“Your Content”) to: (i) make the Site available to you; (ii) manage your Account; (iii) address questions and issues; and (iv) process purchases. You hereby represent and warrant that you own all rights to Your Content or, alternatively, that you have the right to give us the license described above. You represent and warrant that Your Content does not infringe on the intellectual property rights, privacy rights, publicity rights, or other legal rights of any third-party. You may terminate your participation at any time by discontinuing use of our Site. If you have a dispute with us relating to the Site, immediately cease all use of our Site. Ceasing use of the Site is your only remedy with respect to any dispute that you may have with us. 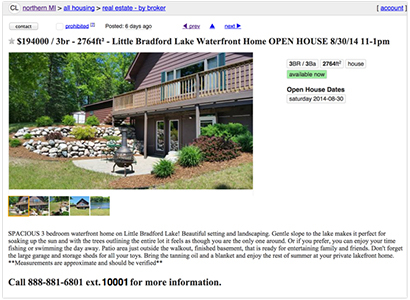 Your Listings-to-Leads account is month-to-month. If you terminate (cancel) your account during your billing period, your account will be cancelled immediately with no refund or proration of payment. PLEASE NOTE THAT THIS AGREEMENT AND ACCOUNT PRICING IS SUBJECT TO CHANGE AT ANY TIME. When changes are made, we will make a new copy of the Agreement available on the Site. We will also update the "Last Revised" date at the top of the Agreement. If we make any material changes, and you have an Account, we may also send an e-mail to you at the last e-mail address you provided to us pursuant to this Agreement. Any changes to the Agreement will be effective immediately and your continued use of the Site constitutes your acceptance of such change(s). YOU AGREE TO REGULARLY CHECK THE SITE TO VIEW THE THE CURRENT TERMS OF SERVICE. Our Site incorporates links to third-party websites. Some third-party websites may collect data or solicit personal information from you. We neither own nor control such thirdparty websites and are not responsible for their content or actions. Please read the terms and conditions and privacy policies of any third-party website that may be linked to our Site. By providing your email address to us or creating an Account you consent to receiving emails from us and from our third-party providers and affiliates. These parties may send you emails in order to deliver information about products and services and to help with fulfilling your order. You may unsubscribe from these emails at any time by clicking on the “unsubscribe” link included in any email or by contacting us via email at support@listingstoleads.com with the word “UNSUBSCRIBE” in the subject line. You may also contact us telephonically at 888-508-8322 if you wish to unsubscribe. The foregoing information (“DMCA Notice”) should be sent to our “Designated Agent” at: support@listingstoleads.com. You can cancel this service at any time. Just text "STOP" to 25678. After you send the message "STOP" to us, we will send you a reply message to confirm that you have been unsubscribed. After this, you will no longer receive messages from us. If you want to join again, just sign up as you did the first time and we will start sending messages to you again. If at any time you forget what keywords are supported, just text "HELP" to 25678. After you send the message "HELP" to us, we will respond with instructions on how to use our service as well as how to unsubscribe. For all questions about the services provided by this short code, you can send an email to support@listingstoleads.com.